NASA will today end attempts to contact its Spirit Mars rover, killed by lack of sunlight during a "stressful" Martian winter. The agency last heard from Spirit on 22 March 2010, when it transmitted from the sand trap in which it had been stuck since April 2009. The orientation of its solar panels led scientists to conclude it probably wouldn't be able to generate enough power to survive a harsh Red Planet winter, and as the rover's internal temperature fell to an estimated -55°C, it was doomed to an icy death. NASA explains: "Engineers' assessments in recent months have shown a very low probability for recovering communications with Spirit. Communications assets that have been used by the Spirit mission in the past, including NASA's Deep Space Network of antennas on Earth, plus two NASA Mars orbiters that can relay communications, now are needed to prepare for NASA's Mars Science Laboratory mission." Dave Lavery, NASA's "program executive for solar system exploration", said: "We're now transitioning assets to support the November launch of our next generation Mars rover, Curiosity. However, while we no longer believe there is a realistic probability of hearing from Spirit, the Deep Space Network may occasionally listen for any faint signals when the schedule permits." Spirit landed on Mars on 3 January 2004, followed by its twin, Opportunity, on 24 January. The pair were expected to operate for three months, but battled heroically on. 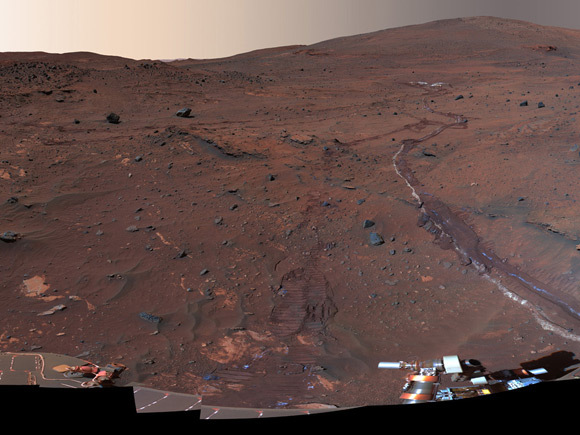 Opportunity is still operational, and continues to trundle across a plain of windblown sand on a "long-term trek" towards a crater dubbed "Endeavour".